All vehicles and loads wider than 10 ft. will be required to use a 224-mi. detour, with signs directing wide-load traffic to U.S. 93, Nevada State Route 319 and Utah State Route 56 between Las Vegas and Cedar City, Utah. 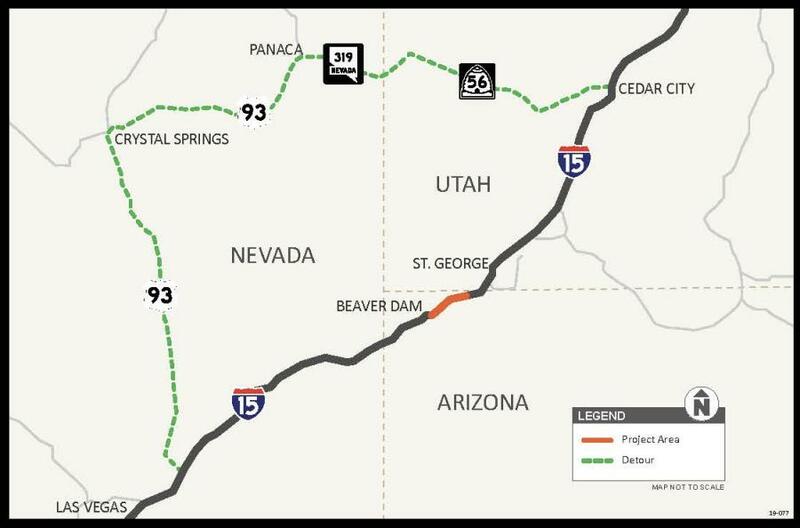 Motorists using Interstate 15 in far northwestern Arizona will need to budget extra travel time over the next year as the Arizona Department of Transportation improves the decks of three bridges through the Virgin River Gorge between St. George, Utah, and Mesquite, Nev. Completing this $6.4 million project, which is scheduled to wrap up in spring 2020, will require reducing the width of travel lanes to 10 ft. during construction. All vehicles and loads wider than 10 ft. will be required to use a 224-mi. detour, with signs directing wide-load traffic to U.S. 93, Nevada State Route 319 and Utah State Route 56 between Las Vegas and Cedar City, Utah. Along with other improvements ADOT has made to I-15 bridges in recent years, this work will extend the lives of bridges along this busy corridor for commercial and passenger travel.